Just pulled into Lordsburg, New Mexico, the jump off point for any serious CDT thru-hike. Here we go for a quick recap of the past few days, a few photos, and some final thoughts -- not final, never final, but final thoughts before I start this lil' old hike. I met up with my folks on Monday evening earlier this week and we've spent the last few days taking a leisurely little road trip down towards the Mexican border. While it's been nice to catch up with them, eat a lot of food, do some sightseeing, and eat a lot more food, I've got to admit this much, I sure am glad that I won't be spending almost any time in a motorized vehicle for the next five months. These legs are ready to rock and roll. Our first stop along the way was Mesa Verde National Park, Colorado where we had a chance to take a great tour of some incredible Pueblo cliff dwellings. Really great park, I recommend it. Also, take the tour! Unless you don't care for history, anthropology, and cultural studies -- in which case, you probably haven't (or can not) read this far into today's post. We stopped at Four Corners National Monument, however I prefer not to write anything about that dismal piece of the American travel-tourism industry. 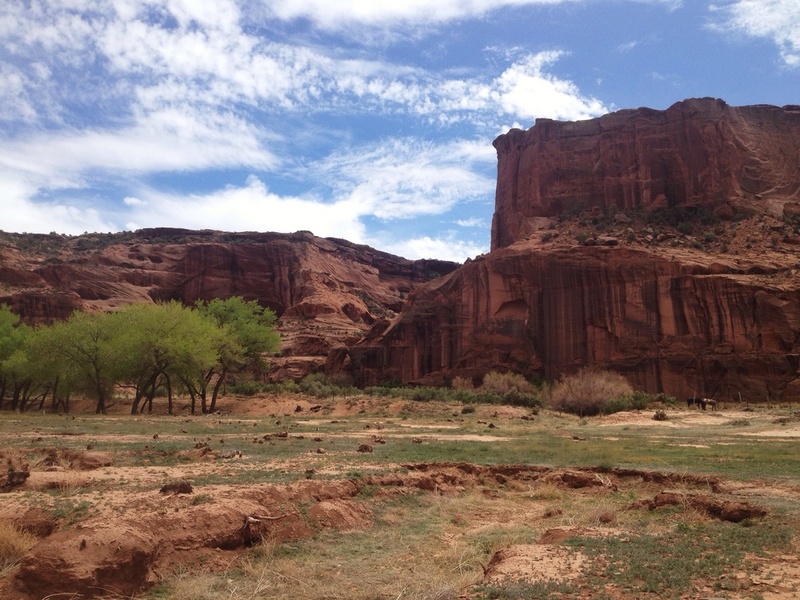 Our second major stop was at Canyon de Chelly National Monument, Arizona. Again, this is a very neat and culturally packed experience. It includes, a very cool canyon, and some ancient Navajo ruins / cliff dwellings. However, as with the Four Corners Monument, much of this experience is tarnished by presentation. 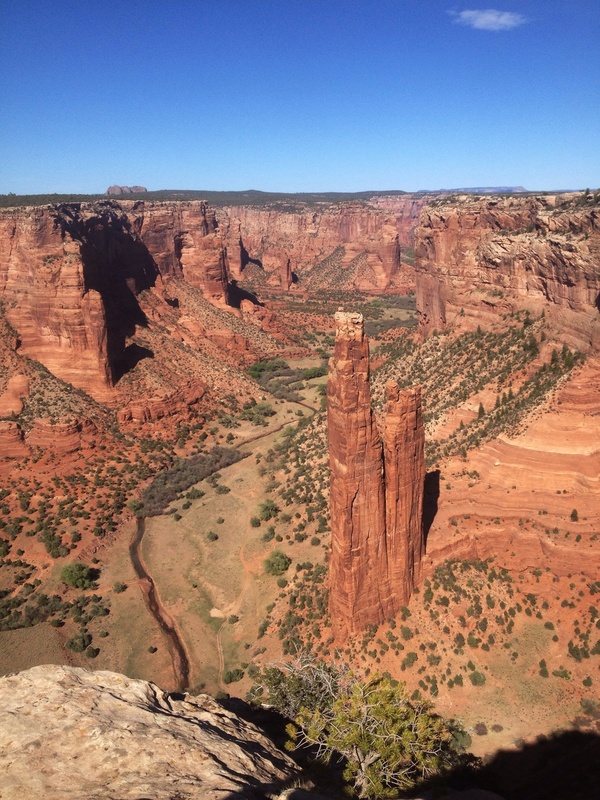 Spider Rock - Canyon de Chelly National Monument, Arizona. There is no doubt in my mind that had I been backpacking or hiking through Canyon de Chelly I would have been awestruck for the duration of my time spent in the area. It's absolutely gorgeous. However, imagine this, a great big diamond -- something "priceless" and unique -- only it's tossed in a beat up ziplock bag with the word "great big diamond" scrawled over it, then throw into a crumpled brown bag, and then presented to you? 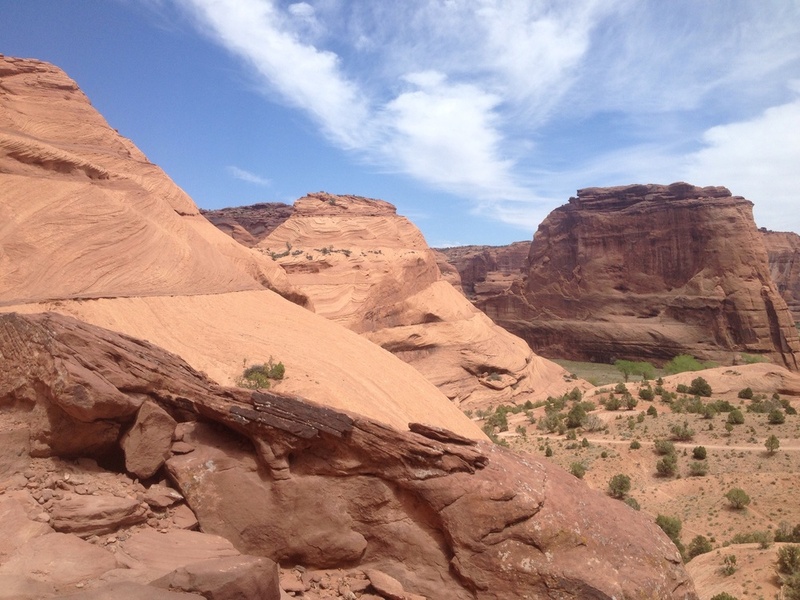 This is the Four Corners Monument, but more-so Canyon de Chelly. 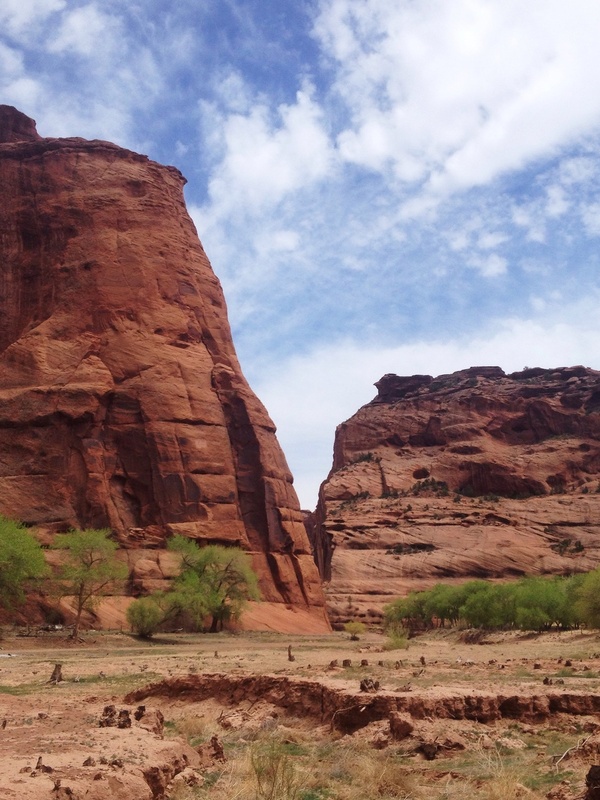 Canyon de Chelly is strangled from all sides by "scenic highway". Every quarter mile or so it offers a "scenic view point". These are scenic, it's true. Of course, at each of these road side attractions you are bombarded by Navajo sales people. This leaves you two options, you can buy something, or you can ignore them and carry the hidden guilt that accompanies being of European descent and in some distant and irrelevant way, having stolen their land. If you wish to enter the canyon itself, good luck, as it must be done with a guide or more likely on a "jeep tour". These novel tourist carrying mechanisms allow everyone and anyone to view the canyon from America's favorite position, their seat. And for only the cost of ten dollars a person (as well as the additional undocumented cost, paid by our Mother Earth, in erosion, trash, water, and noise pollution,) why not? 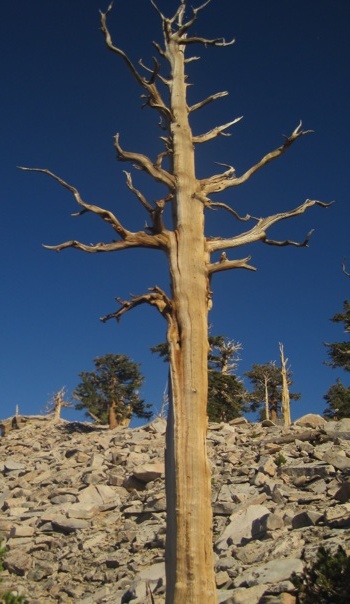 All is not lost, as there is one hike that you are "allowed" to take to get to the bottom of the canyon. And, it is a nice hike on a very well maintained trail. Be forewarned, when you reach the bottom of the canyon and approach the Navajo ruins, you will be bombarded by further sales people and a deep canyon taxi service (carrying the usual taxi accoutrements, filth). Petrified Wood National Park, Arizona. Our last major stop of the trip was at Petrified Wood National Park, Arizona. There are a few interesting things to see within the park, but in all fairness, it is possibly my least favorite national park I have yet visited. The park does contain some interesting "bad lands" style terrain, the highest concentration of petrified wood in the world, and a couple of ancient Navajo ruins. Be forewarned, as has been the case, this is a park designed by and for motorists. Now, before you call me a curmudgeon, or worse, I do understand, these parks need funds in order to preserve what otherwise would and could not be preserved. And, we need public interest to generate funds, therefor we need public access. Fine. But when generating funds and increasing public access becomes the goal within itself, while the true goal, conservation and preservation, is lost behind spread sheets of daily, weekly, monthly, and annual attendance/income, then we've now lost ourselves. Have a road, have a visitor center / museum, charge a fee, and put a few trails in (hell, I still need a job, right?). Maybe a bus system within the park when necessary. Sure, attendance and therefor admission tickets will go down. Sell off a single military fighter jet and you can fund these small parks (with now decreased infrastructure) for ten years apiece. With less infrastructure, money may even go to research and conservation efforts, rather than road repairs. In doing so, we may actually maintain the beauty of these areas and increase our collective knowledge of ancient cultures. But enough. It's not all doom and gloom! The upside, as I have been prepping for this hike (eating) and touring America's greatest roadside attractions (largely from a comfortable climate controlled sitting position), I have been bombarded by people of every possible shape and size. Every shape and size except for "healthy and fit", that is. I haven't started the hike yet, but I sure feel like a champion. I have been able to get some updates on water conditions down here in the southern section of trail and things do sound promising. Not to say that there is a lot of water, but that most water sources do in fact have water in them. I'm ready to go. And I'm confident. I'd be remiss if I didn't also mention that I am fully awake with muscles tensed in direct proportion to my nerves right now. I'm not worried, but rather anxious. That's the way it goes before anything worth pursuing, let it be adventure, love, financial gain. Any change. I wouldn't have it any other way. I'll sure be glad to get down to the Mexican border and take those first few steps north tomorrow.